For the past week I’ve been working on details getting ready to have my first vendor booth, at the inaugural Boise State Craft Fair. Of course, I didn’t get everything done. And I’ve put customer quilts on hold for this week, which feels really strange, and instead, working on a Bronco T-shirt quilt. Well, actually, I’ve been working on several at a time, as usual. The Quilt Cave is strewn with blue and orange! The main one I was focusing on didn’t get finished; it’s at the border stage and merrily hanging in the middle of my booth anyway! It definitely got noticed and when I finish it I think it will sell quickly. It’s been cold at the inaugural Bronco Craft Fair today, and very windy. How cold was it? Cold enough to have on a sweatshirt, windbreaker (that really works! ), ear warmers, hat and still need to wrap up in an extra quilt! My feet were like icicles all day! We have a wind advisory starting at 3pm…I think it started sooner than that, because at 1:30 booths started blowing into the street and one knocked over a bunch of displayed glassware! My quilt stands blew over several times and the quilts were flapping in the breeze. I checked with the event coordinator and she said it would be OK to move to another place, but with so little time left before the end of the event, I didn’t want to break it down and reassemble it again for a 2 hour time frame. As I was packing up, Security came over and confirmed that I should take it down. The summary for the event: no quilts sold, but I handed out several cards and flyers so I should be getting some calls for quilting services or T-shirt quilts. I also realized I should have more items on hand for people to peruse. The problem is, I just want to make quilts! This sort of weather, and standing for long periods really wears me out. We decided to forego the Bronco Spring Game and came home. I put my feet up and enjoyed a cup of double spiced chai tea and am contemplating how I’ll finish out the day. I’ll definitely have a booth next year! 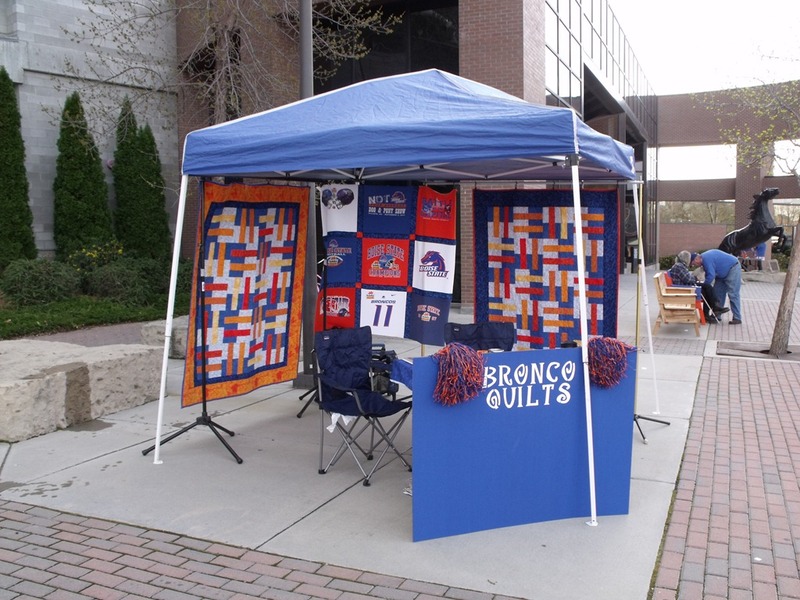 This entry was posted in Bronco Quilts, Quilting and tagged Bronco quilts, Quilting. Have you all seen the new mystery quilt that Bonnie Hunter is running again this year? I want to participate, but I’m stuck on my colors! I love brights, but they don’t go with anything in my house; DH sort of over-ruled that idea! Ha! So, we have all of the earth colors and I’m still trying to figure out what I can pull together that will work in the living room, and will be a quilt he’ll actually use. All of this indecision, and the third step is already posted! …not to mention that I need to make a Bronco quilt for a customer before Christmas, and complete 2 other small customer quilts! This entry was posted in Bonnie Hunter, Bronco Quilts, Quilting and tagged Bonnie Hunter, Bronco quilts, Quilting.